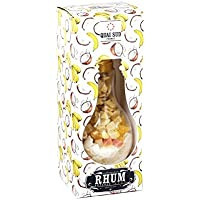 Make your own rum arranged with notes of coconut and banana and dégustez-le in a glass in the shape of a light bulb with a straw. 160 g Ingredients: Coconut 27.7%, Papaya (Papaya, sugar cane, E220 (sulfite)), Mangue (Mango, sugar, citric acid, E220 (sulfite)), pineapple (Pineapple, Sugar, Citric Acid), bananas per cent (Banana, Coconut Oil, Sugar, Flavouring. Instructions for use: In a large container (bottle, carafe), pour the contents of the bulb as well as to 2.25 Litre of white rum with 4 tablespoons of sugar cane and made for 1 month. Filter. Taste: Pour 10 ml of filtered preparation in the bulb and drink as is, or with fruit juice or water. Alcohol abuse is dangerous to your health, drink in moderation. Store in a cool, dark place. Possible traces of nuts, sesame, mustard, gluten, milk, egg, soy, sulphites.